Birthday are a big deal at our house. I like to make everyone feel loved on their special day. One of the ways that I do that is by making whatever dessert they want for their birthday. 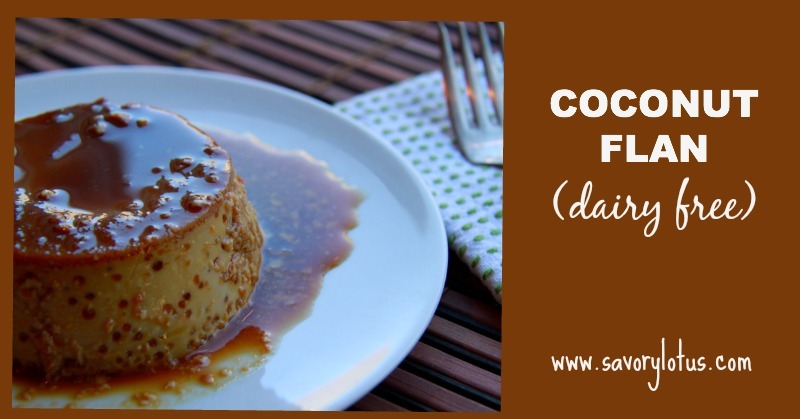 My sweeties loves flan, so this year I came up with a dairy-free Coconut Flan. Not only was it beautiful to look at, it was amazingly creamy and rich as well. Happy Birthday to the most amazing partner and papa in the world. I love you. Traditional flan is usually made with sweetened condensed milk. Since this is a highly processed milk product with lots of added refined sugars and synthetic vitamins, I decided to skip it. I made my own version of sweetened condensed milk using coconut milk (where to buy BPA and additive free coconut milk) and unrefined coconut sugar . Not that I have anything against good quality dairy, but my organic, RAW milk is too precious to denature by cooking it for a long time. I think you are going to LOVE this recipe. It’s the real deal when it comes to flan. It’s made to be a treat. It knocked my socks off when I ate it. Deliciously creamy and full of flavor. The ingredients are simple. The sugar is all unrefined coconut sugar. If you want to make it a bit less sweet and more like a custardy snack, feel free to substitute honey in the condensed coconut milk and skip the syrupy topping. Either way, you taste buds will be delighted. In a small sauce pan, heat coconut milk until beginning to bubble at the sides. Add 1/2 cup of coconut sugar and whisk until completely dissolved. Allow to simmer gently for 20 minutes to reduce (will reduce by 1/3-1/2 of original volume.) Remove from heat and add salt, vanilla, and lemon zest. Mix to combine. Allow to cool for at least 10 minutes. Preheat oven to 325’F. Fill a large baking dish 1/3 full of water and place in oven. In a small sauce pan or skillet, heat the remaining 1/2 cup of coconut sugar and 2 TBS of water over medium heat until completely dissolved and beginning to bubble. Stir constantly with a wooden spoon to prevent burning. Once it is syrupy, VERY CAREFULLY pour equal amounts of caramel into 6 ramekins. Whisk 6 eggs together in a medium bowl. Slowly, pour a gentle stream of the reduced coconut milk mixture into eggs, whisking constantly to prevent eggs from cooking. Pour mixture into caramel-lined ramekins. Place ramekins into hot water bath in oven and bake for 45-50 minutes until custard is set. OK if center is still a bit wiggly. Remove from baking dish from oven and remove ramekins from baking dish. I use tongs here. Allow to cool then place into fridge for several hours. To serve, run a knife along side of ramekin and carefully invert onto plate, allowing caramel to flow over custard. Enjoy!! If you like custardy desserts, you may also enjoy Heavenly Sweet Potato Pudding, Blackberry Brulee, or Baked Pumpkin Custard. Eggs are most definitely dairy…. Never heard of eggs being confused as a dairy product before. lol. haha! do they come from a cow? Lmao! Eggs come from cows now? ??? When I make flan with milk I filter it through a cheese cloth for a smoother custard. will it improve the dessert if I do that with this recipe too? 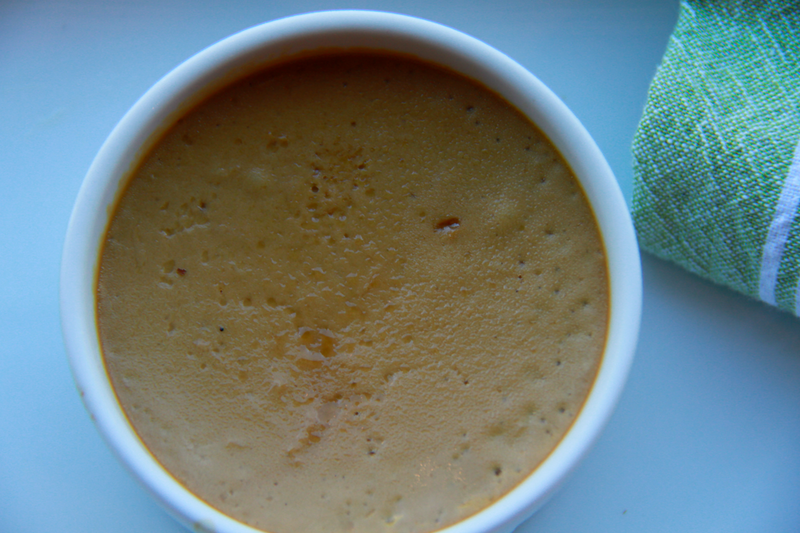 You’re the top search result for paleo flan recipe on pinterest; I see why! Question, what can I use instead of 1 cup of coconut sugar? I don’t need that much sugar pumping through my system. Can I sub in stevia? If so I imagine I use about 1 teaspoon of the powdered form of stevia for a cup of sugar. You would have to experiment. I would love to hear how it goes. You can always leave out the sugary topping to reduce sweeteners. Thanks for coming by! And for the kind words! Looks great! Can you tell me what the particles clinging to the sides of the flan in the picture are? Undidsolved sugar perhaps? Also, will this recipe quantity work in a pie plate instead of individual custards cups? I’m not sure I can get hold of coconut sugar. Can I substitute granulated or caster sugar? I made this recipe tonight. Soooo delicious! 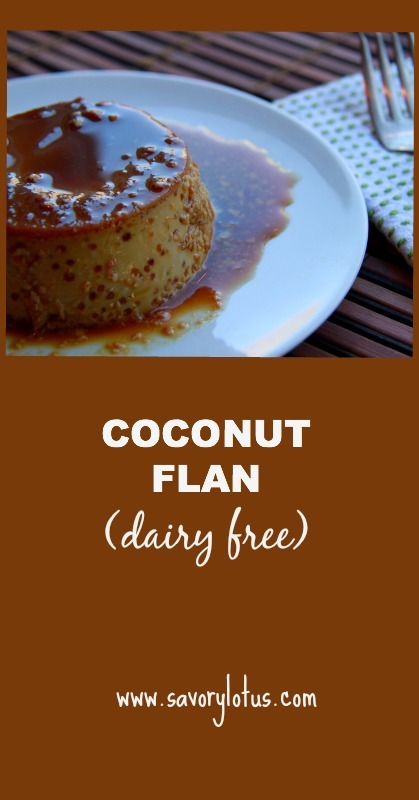 I’ve been wanting to try a coconut flan ever since going dairy-free 3 years ago. Thank you! How much would this recipe be in quarts? I have a flan maker that I’d like to use, which holds 1.5 quarts and I’m unsure as to whether this will all fit. Hi, Cynthia! Hmmmm… well, I do know that the 2 cans of full fat coconut milk is about a quart, since a quart is about 30 ounces. After cooking down, you are left with about 2/3 to 1/2 of that. Then you have the add in the 1/2 cup of sugar and 6 eggs. The only way to know exactly is the experiment. I would love to hear if you do! Is the lemon zest optional? I made this recipe and it came out great. Thanks! Just made this tonight! I halved the recipe and it filled 2 of my oversized ramekins. I had to add 1 tsp vanilla and a pinch of salt to the caramel syrup. Next time, I will actually double the coconut sugar and add more vanilla because my boyfriend and I prefer it way richer. That’s just a preference though and the recipe is fantastic as is! Boyfriend can’t stop raving. You could totally use gelatin. The texture would be different but would still be good. Let me know if you try it. Awesome and a big hit with guests! This flan is absolutely delicious! I will definitely keep this recipe as a favorite. My only question is how to firm up the consistency? I actually made my flan in one larger dish as opposed to individual ramekins, and I found that it was not as firm as I’d like it to be. Would adding a couple of egg whites or yolks help? These turned out delicious! I messed up a little- I used a quarter less coconut milk and it was light, not full fat. It turned out delicious anyway. Oh, good! I’m glad that they turned out. I love making flan. Always a bit nervous to flip them over. 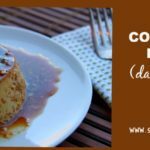 This recipe is so delicious, just what I was looking for to replace the coconut flan I use to make with regular milk. Thanks! Yay! Glad you enjoyed it. It’s my hubby’s fav. I’m planning to make this tomorrow. #4 says to whisk the eggs in a bowl, then add the coconut mixture and keep stirring so that the eggs don’t cook. Since both mixtures are cool, what would cause the eggs to cook? Do I need to warm something up prior to this step or during this step? I made the recipe, delicious, except that I wanted to recreate the taste of coconut flan and the lemon zest dominated. I added fine shredded coconut. Next time I will skip the zest for a full coconut flavor. To me coconut and lemon don’t mix well, all recipes with lemon have spoiled the paleo recipes to me. Thanks for this recipe! Hi! I made this recipe last night and turned out delicious! I just noticed that I messed up with the quantity of the coconut milk. I bought 2 cans of 270ml (9,5 oz), so half what it should be, therefore, it was really small. I will try it again with the right amount. I also added a hint of rhum, to add the Venezuelan touch! Thanks for this recipe, I suggest to add the exact quantities to the recipe.